The now-annual Canadian military exercises in the Arctic were established to buttress Canada’s claim to part of the Arctic sea floor where Russian and Canadian claims overlap. Russia is establishing permanent military bases in its northern territories to support its claim, and all five Arctic nations are racing to gather data to support their claims amid reports that global warming could leave the resource-rich region ice-free and accessible by 2030. 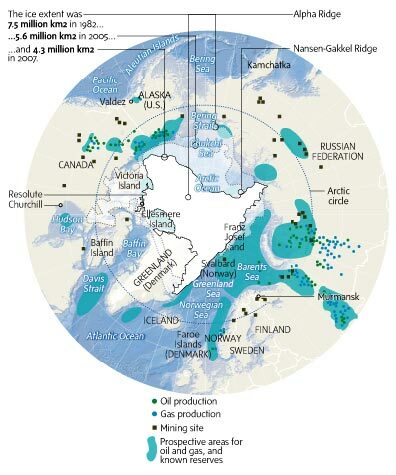 The United States Geological Survey says the Arctic seabed could hold 13 per cent of the world’s oil reserves and 30 per cent of its gas resources. The rival nations are Canada, Denmark, Norway, Russia and the United States. In 2012 the data from each will go before a United Nations panel that will decide which nations own which sections of the Arctic seabed. A Russian scientific expedition — led by a nuclear-powered icebreaker — has set sail for the Arctic to solidify Russia’s claim, and has announced it will station two new Arctic warfare brigades north of 60 degrees — a move that will expand Russia’s northern military capabilities far beyond those of Canada, according to the Montreal Gazette. According to the Canadian Defence Department, Operation Nanook 11 is to play out in several phases on and near Baffin Island and Ellesmere Island, with more than 1,000 Canadian Forces personnel participating. It will involve CF-18 fighter jets as well a surveillance and transport aircraft, a warship, infantry companies from Quebec and Alberta, and 5 Canadian Ranger Patrol Group — Inuit reservists who have broad experience surviving in the extreme environment of the Far North.